Gilbert Parfitt was born on 22 December 1886 at Kingswinford, Co. Staffordshire, England. He attended school in Birmingham and entered the profession there after 1905. In early 1912 he emigrated to Canada and arrived in Winnipeg in April 1912. The following year he accepted a position as draftsman in the provincial Dept. of Public Works, working under the direct supervision of Victor Horwood, the Chief Architect of that department in 1913-15. When Horwood retired, Parfitt continued to work under William Fingland, the Acting Provincial Architect, until May 1920. He appears to have taken up private practise and he completed several commissions, either under his own name, or in collaboration with Edgar Prain. From 1929 onward, he was once again employed by the Province of Manitoba, at first in the capacity of Acting Building Superintendent (1929-33), then as Building Superintendent (1933-44), and finally as Provincial Architect & Superintendent of Public Buildings from 1944 until his retirement from the post in 1957. 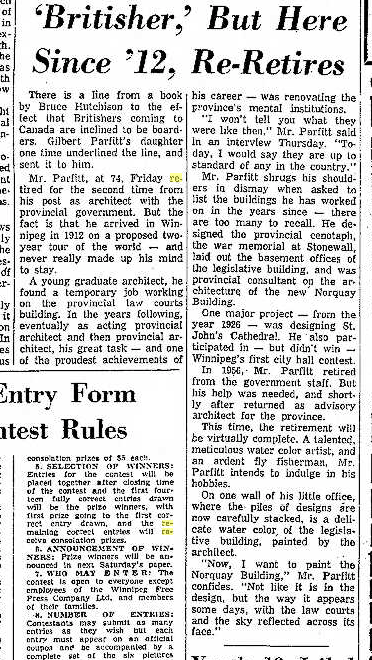 Parfitt was one of the founding members of the Manitoba Association of Architects in 1914, and he remained a member until his retirement from the MAA in 1961. He was a respected member of the profession and his colleagues elected him twice to the position of President of the Manitoba Association of Architects, the first in 1927, and again in 1942. Parfitt moved to British Columbia in 1963 and died in Vancouver on 24 May 1966.